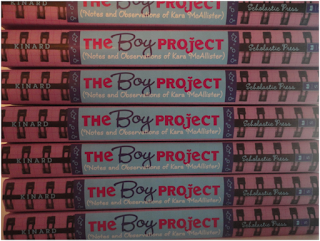 I’ve written a lot of blog posts recently to promote my book THE BOY PROJECT (Scholastic 2012) but I’m not sure I’ve ever been this excited about guest posting because I have a real thing for notebooks. I LOVE them. I RELY on them. I COLLECT them. I can’t help it. I like them so much that I’m even jealous of Amy for thinking of this absolutely unique, completely wonderful, blog! Later my notebooks were really diaries. I kept a lot of notes and drawings in them. 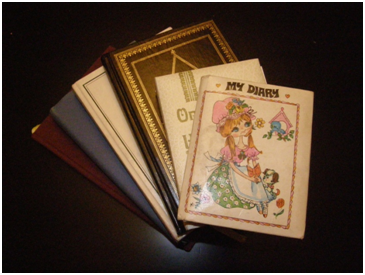 Some of these diaries inspired me to write THE BOY PROJECT. Here is a picture of them. 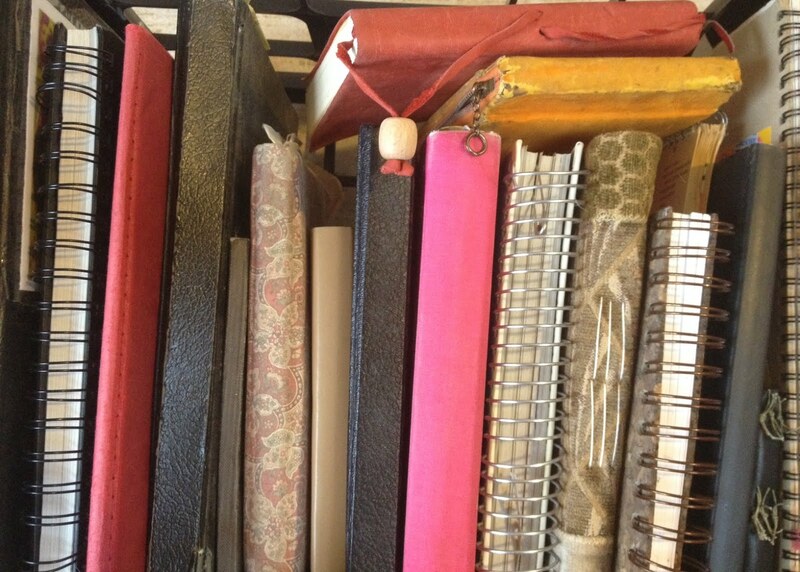 I’m not a very organized person, so when I started writing full time, I found that notebooks were indispensable to me. Not loose-leaf notebooks though! I needed the spiral bound kind… the kind that wouldn’t allow me to lose pages. Books with sewn bindings work great too, especially for poetry. This shelf is full of my poetry notebooks. You can see a poem I was working on in the one below. 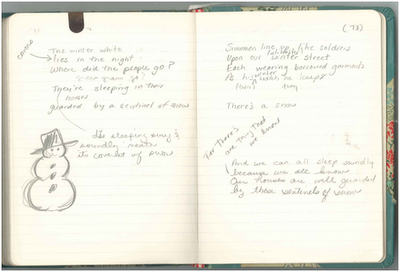 This poem was later titled "Snow Sentinels" and was published in JACK AND JILL. These are spiral notebooks, but their covers are hard, so they are easy to write in when you travel, or when you need to relax in a soft chair. It is kind of like having a little desk attached to your notebook. 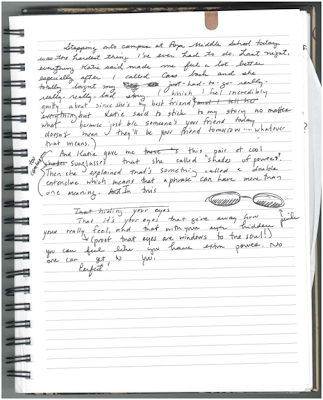 Below is a page from a Picadilly notebook I was working in when writing THE BOY PROJECT. 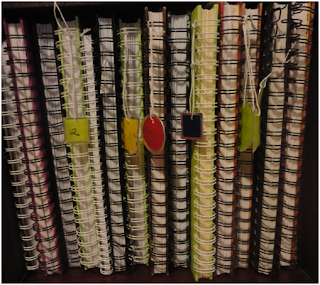 Eventually, I filled so many notebooks that I had to get a notebook to organize my notebooks! You can imagine now, how thrilled I was when my book designers at Scholastic, Whitney Lyle and Kristina Iulo, decided to make the spine of my book look like a notebook! 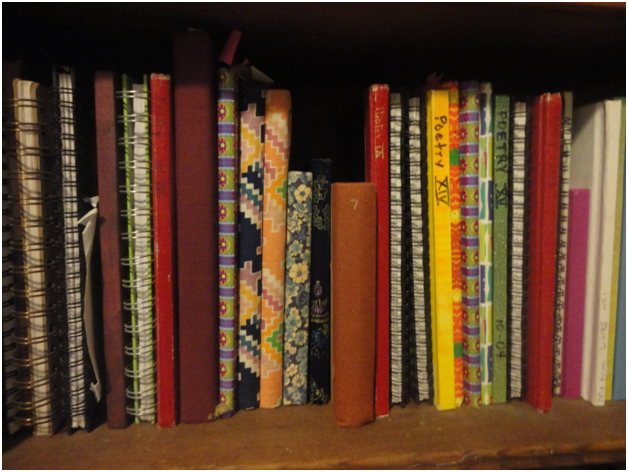 Now a bit about my notebook collecting habit… It seems that I can’t stop collecting empty notebooks. Especially beautiful ones. I’m very particular about the pages though. The lines can’t be too heavy. They need to be light enough to keep the writing neat, but not so dark that they dominate the words. This is because as much as I love notebooks, I love words more! I collect those too, in books! Every empty notebook is a potential story. Every empty page is a potential poem. This is the allure for me, and why when I see a notebook that looks like it’s just waiting for its pages to be filled… I buy it. To celebrate the wonderfulness of notebooks, Kami is giving away this beautiful blank book. Please leave a comment on this post to enter, and the winner will be drawn on Sunday evening, May 13. 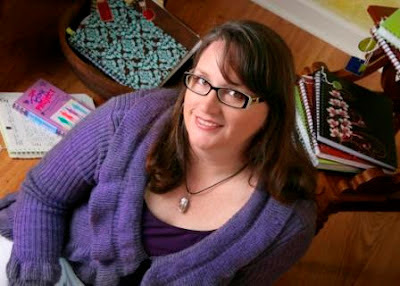 Kami Kinard’s first novel, THE BOY PROJECT: NOTES AND OBSERVATIONS OF KARA McALLISTER, debuted from Scholastic in January 2012. 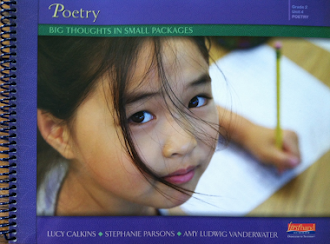 Her poetry, fiction, and nonfiction pieces have appeared in periodicals for both children and adults. NASTY BUGS, a poetry anthology edited by Lee Bennett Hopkins, included her poem "Tick-Tock Tick." 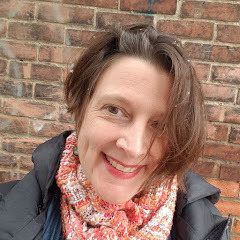 A teaching artist on the South Carolina Arts Commission’s Roster of Approved Artists, Kami holds a MAT degree with an emphasis in English. She grew up in Camden SC, and currently lives with her family in Beaufort S.C.
A notebook to keep track of your notebooks - ha! Thank you for this glimpse inside of your writing life. It is such a gift to hear the love and excitement for words/writing that comes through in your description of your fascination and use of notebooks. I think I must be nosy, because I absolutely love these glimpses into writers' notebooks. I don't know Picadilly notebooks, but they look perfect. I love spiral bindings, with hard covers. 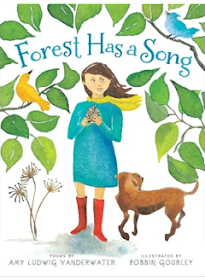 Thanks so much for sharing- we will look for your book! Thank you Dana and Carol! These are the nicest comments ever! I love notebooks! I've written since I was in first grade. (Just WISH my mom hadn't thrown my notebooks out when we moved around.) Teaching writing is my favorite subject. So glad to know this site is here, Kami! I'll share this with my second graders during writing workshop! :)) ~Lisa S.
Ooo, I love this! I've made myself NOT BUY anymore journals until all current ones are filled up--hate it. BUT, I compensate by buying all sorts of pens and pencils in colors across the spectrum. Thanks for sharing! Of course, if I WIN a journal, that's a different horse entirely. It is a pleasure to see that you still have your first notebook from your teacher. How great is that, & to hear that you love to write in notebooks before moving to the computer. 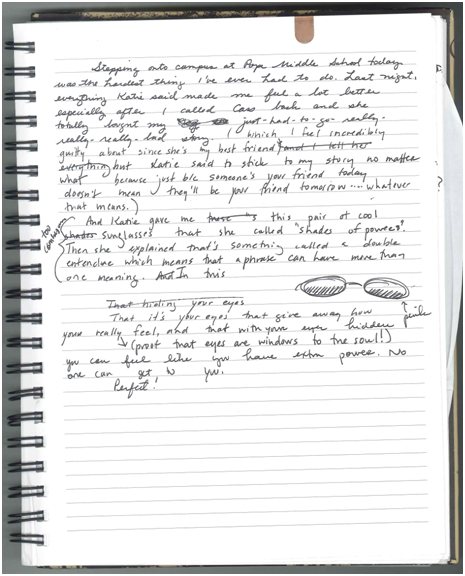 I like the empty journals too, but do much of the writing in those black & white composition books. We each have our own favorites don't we? I will look for your book; congratulations on its publishing! It's always so interesting to peek into other writers' notebooks - you have quote a collection! 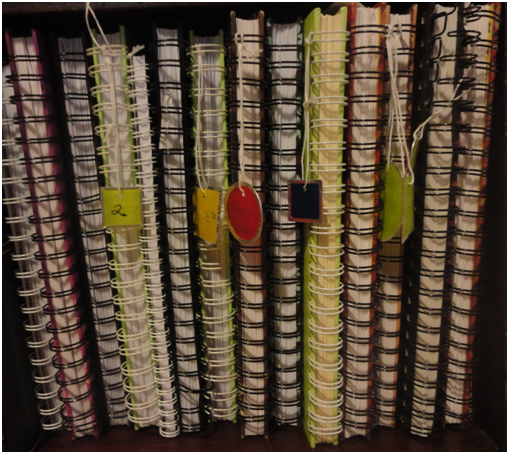 I always encourage my students to save their writers' notebooks from our year of writing workshop...like you have! 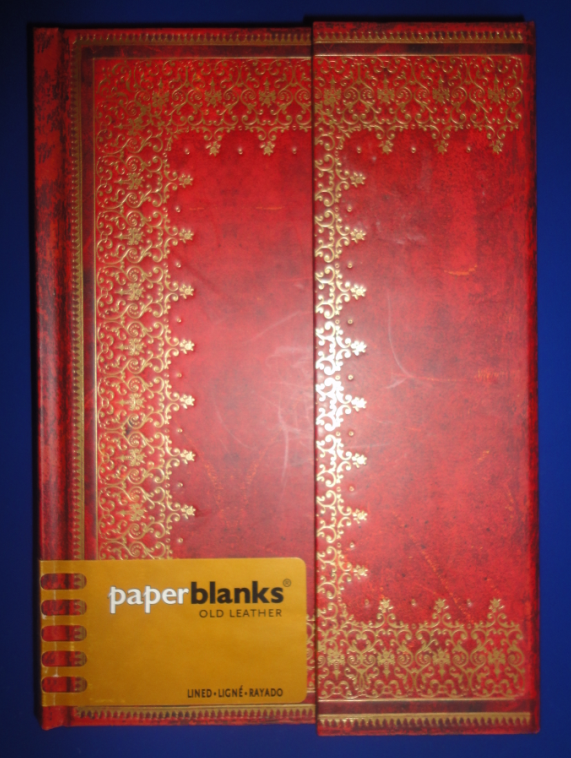 I also love spiral notebooks with nice heavy covers--great description--like having a desk attached. Just put THE BOY PROJECT on reserve at my library. I look forward to reading it! Thanks for posting such a great guest post. I had no idea others felt the same about notebooks. I love love love them! As much as I would love to be in the running for that beautiful notebook, I am in full-on downsizing mode right now. I'll leave the spoils to all the upsizers among us -- because it's always cool to upsize with a notebook. I am very picky about my notebooks, too! For awhile, I had to have unlined pages. Now I need lines, but the lines have to be just right, and especially not too far apart. Picky, Picky, Picky!! Thanks for sharing, and congrats on your novel! It's so much fun to see how different authors work. 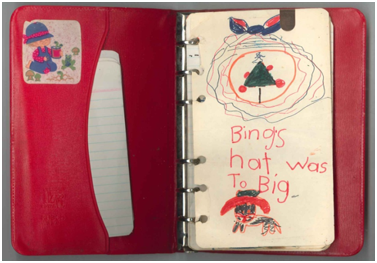 I loved your shelves of notebooks. I have some of mine from when I was a child, and it's fun to read them now, even though some of them are pretty embarrassing. Oh my goodness, I am totally sharing this post with my dad who needs a notebook for his notebooks. Wonderful! 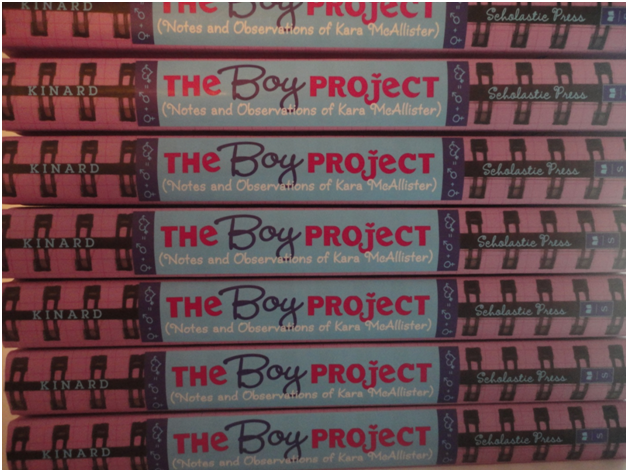 Thanks for sharing, and yay for The Boy Project! Oh no! So sad! I'm too late to win the awesome notebook. :( (And I've even looked at that one before at B&N and truly considered buying it!) Ack! But I loved the interview Amy and Kami.